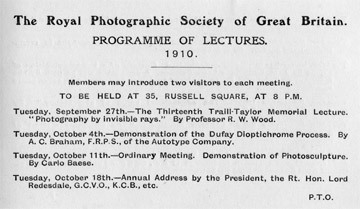 ...that Professor Robert Williams Wood gave his landmark lecture Photography by Invisible Rays to the Royal Photographic Society at its HQ in Russell Square, London. As the RPS members meeting card shows, this was at 8pm. To put this in context, it was only four years since Wratten and Wainwright had started production of the first panchromatic photographic plates available in the shops. Before this photographers wanting to photograph anything red had to sensitise their own plates. Ironically, the new panchromatic photography had its detractors who said that this was not real photography at all; that the world as seen through the lens should only record ultraviolet and blue. Into this photographic world Wood introduced the often surreal and potentially very useful features of infrared imaging. At this time it seems that only Wood (starting in 1908) and CEK (Kenneth) Mees of Wratten and Wainwright and the Croydon Camera Club (who took some of his own plates to Portugal in 1910) had ever photographed infrared landscapes. Now Google images returns ten million hits on the word infrared and over a million on infrared photograph. Wood's landscapes are where it all started, over a century ago. Elliott Landy's amazing infrared portrait of Bob Dylan arrived this morning which means I am now only one image short of the set for the Infrared 100 exhibition. Ilford have done an amazing job printing up the historic images we got from archives both here and in the USA and the photographers I contacted have been extremely helpful in supplying prints and, in many cases, matting them to fit the RPS frames. Even the RPS president has joined in the fun by cutting loads of mattes and even solved the problem of how to frame a century-old edition of the Illustrated London News. I'll post a list of the images in a day or so but any of you within striking distance of Bath should make an effort to come along to Fenton House. Details in the later post. The second day of the symposium at Burlington House (which also houses the Royal Academy in Piccadilly, London) on October 8th is dedicated to infrared astronomy and organised by the Royal Astronomical Society. Chairs for the day are Helen Walker and Peter Clegg. A booking form is available on the RPS-ISG web site and there is a discount for attending both days. Here is the programme for the first day of the two-day Infrared 100 Symposium at Burlington House, Piccadilly London on October 7th. I'll add the second day program (which is on astronomical infrared) tomorrow. The event will be opened by the President of the Royal Photographic Society, Rosemary Wilman Hon FRPS. A booking form can be found on the RPS Imaging Science Group web site. I have already mentioned Dr Chris Lavers' talk Swords to ploughshares but Chris tells me the date has been brought forwards to Tuesday November 9th at 8pm. The venue is the @Bristol Centre Science Café. More school exhibitions are planned for 2011. Just a quick reminder in case you are heading for the IBC exhibition or conference at the RAI in Amsterdam. There will be a session on Monday 13th September at 1400 called Broadcasting with Invisible Light which will look at how infrared imaging has impinged on television and the movies in the past 100 years. Speakers are Iain Logie Baird talking about his grandfather's work on infrared TV in the 1920s and 30s, Professor Rod Thomas explaining and demonstrating thermal imaging, Colin Jackson from the BBC Natural History Unit showing how they do programmes like Big Cat Live with infrared technology ... and me with a few explanations about how it all fits together and showing a couple of extracts from movies that used infrared. [Later] Fascinating session for a select audience and I am now learning a lot more about Baird's Noctovision. Thanks to all who came along. There will be a small but select exhibition of infrared images at the Royal Photographic Society HQ in Bath running from Friday October 1st to Friday October 28th. The images on show will represent historic and contemporary work with a mixture of scientific and artistic images. Photographs include the work of photographers including renowned artists Abe Frajndlich, Elliott Landy and Simon Marsden, as well as Society members including Tim Rudman, Clive Haynes and Alan Lewis. The opening hours are 9.30am – 4.30pm, Monday to Friday; admission is free. We have a new infrared photographic web site joined to the project. The enigmatically named Digital Dome, from Malaysia, and his exotically coloured views from, what is to me, the other side of the world.